Helen Oswald was elected as an SNP councillor for the Sidlaw East ward in 1999. 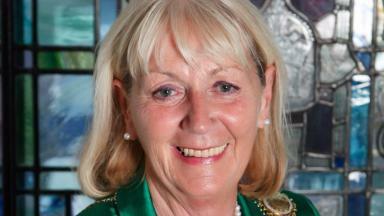 Tributes have been paid to Angus provost Helen Oswald, who has died after a battle with cancer. Mrs Oswald took up the role at Angus Council in 2012 having been elected as a councillor in 1999. She was the SNP member for the Sidlaw East ward before becoming one of three Carnoustie and District councillors in 2007. The 69-year-old died on Thursday morning having been being diagnosed with cancer last year. Iain Gaul, leader of the council, said: "Since Helen was diagnosed with terminal cancer she has behaved with courage, dignity and a desire to continue to be the best she could be. "Nobody who knew her was surprised at this, as that is the mark of the woman she was. "Angus has lost a distinguished and well respected provost. The Carnoustie area has lost a hard working councillor. I have lost a well-loved friend." Mrs Oswald was married to Ed and their daughter Kirsten was elected as SNP MP for East Renfrewshire after defeating former Scottish Labour Party leader Jim Murphy at the 2015 General Election. Chief executive Richard Stiff added: "Helen always showed genuine and heartfelt concern for the issues brought to her. "She championed the needs of constituents and ensured that their voices were heard and their views listened to. "As provost, Helen was the ultimate ambassador for Angus. She radiated enormous pride in the county and its people and used her role to celebrate and recognise the achievements of local people in all walks of life." He added: "Helen was an outstanding provost and will be long remembered. "Helen was also very proud of and grounded in her family. At this sad time my thoughts and those of all the staff at Angus Council are with her husband Ed and their family."